ADEKS TRAVELS AND TOURS: EXPLORE EUROPE, LETS GET A SCHENGEN VISA FOR YOU! EXPLORE EUROPE, LETS GET A SCHENGEN VISA FOR YOU! Although a small country - it covers less than 1,650 square kilometers and has a population of a little more than 500,000 - Luxembourg (or in full, the Grand Duchy of Luxembourg) delivers considerable diversity. 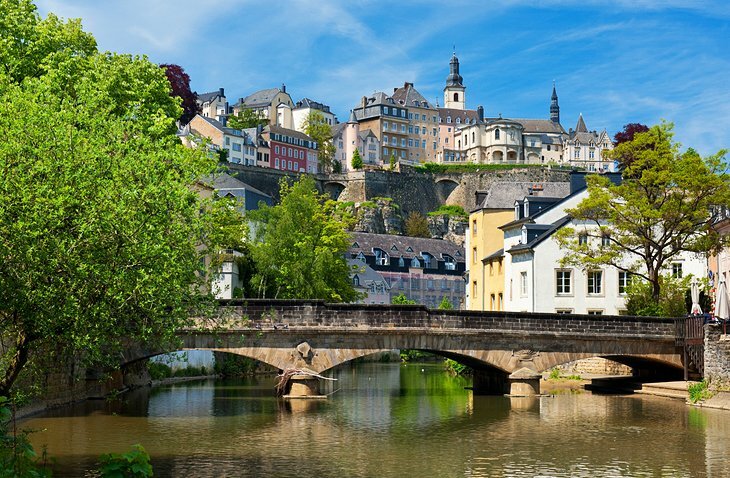 While many of the country's major attractions lie in vibrant Luxembourg City, the old quarter of which has been designated a UNESCO World Heritage Site, Luxembourg's many small towns are lovely. It's also an easy country to travel around, whether on foot in the capital city, on a driving tour through the picturesque countryside, or town-hopping by train. 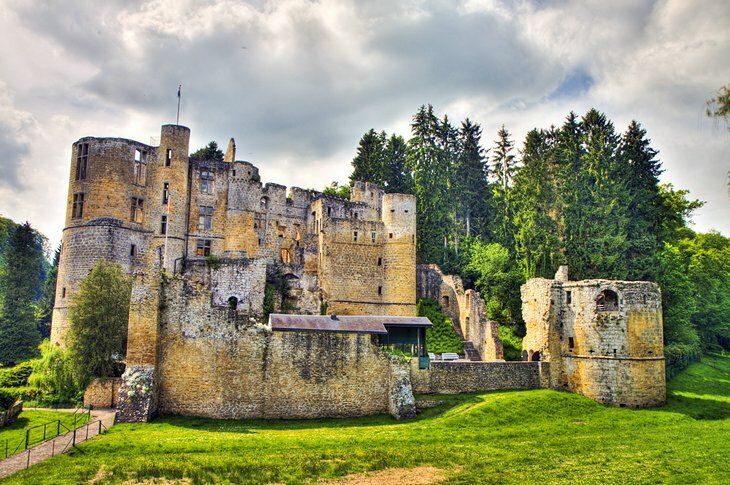 Old fortresses and beautiful castles compliment the scene, making it a popular tourist destination that is frequently visited in combination with surrounding countries such as Belgium and the Netherlands. 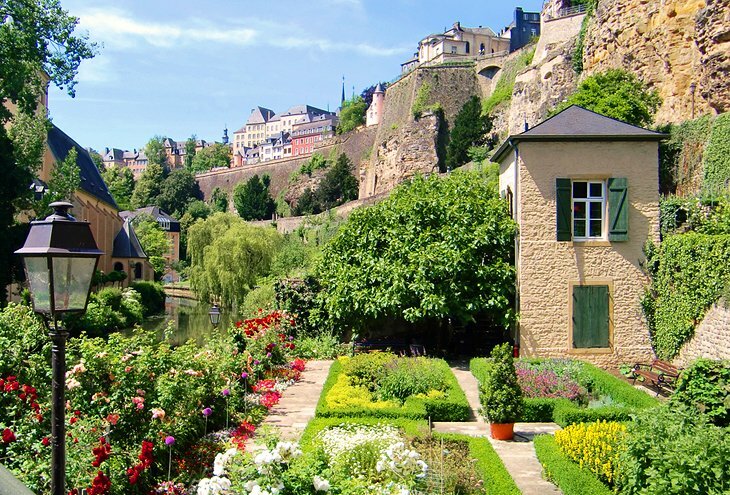 There's no better place to begin exploring beautiful Luxembourg City than in its historic Old Quarter. Designated a UNESCO World Heritage Site in 1994, the city's ancient fortifications made it one of the most important of Europe's cities. The fortress was so impregnable it was dubbed the "Gibraltar of the North," and although the original fortress was dismantled between 1867-1883, its impact upon the Old Quarter is evident everywhere. Today, the old fortifications have given way to beautifully laid out parks and gardens, while it's cobbled streets are lined with charming old homes and buildings. It's a great place to spend a few hours exploring as you cross its many bridges and traverse its many alleyways, preferably without a map - just follow your nose and see where you end up! 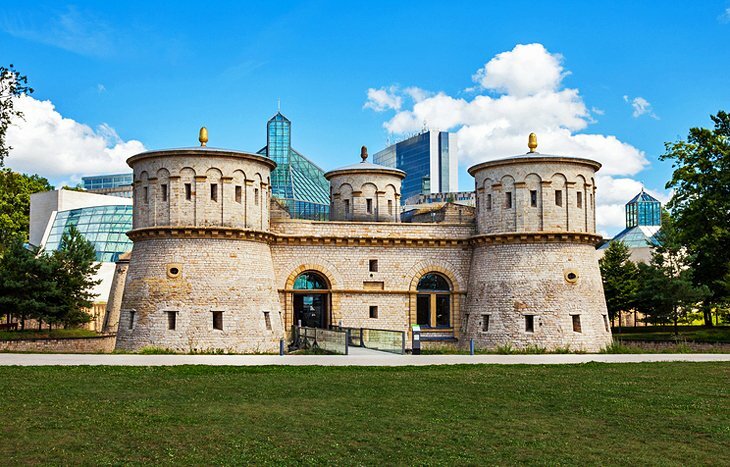 If you were to judge Luxembourg City on the quality of its museums - never mind its status as one of Europe's most historically important cities - it would still rank extremely high on the list of the continent's must-see cities. Topping the list is the National Museum of History and Art. In the historic Fish Market area (the old town center), the MNHA collections - art objects, archeological finds, furniture, tools, coins, arms, and documents dealing with the history of the country - are housed in a stunning new building. 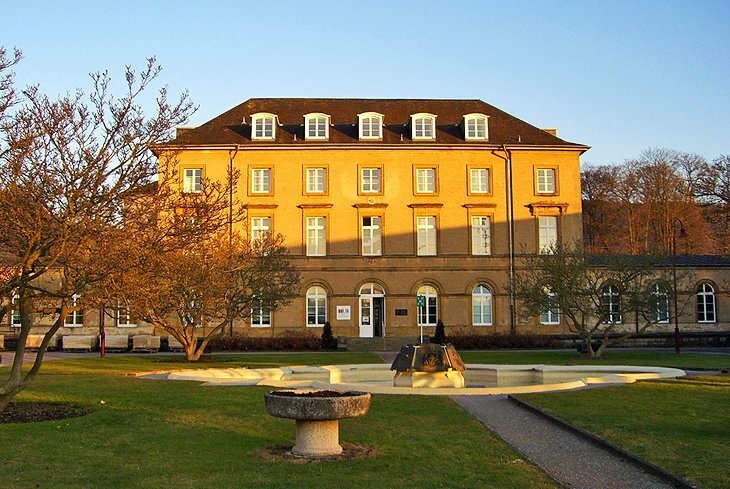 There's a particular emphasis on the Gallo-Roman period and displays illustrating the artistic, social, religious, and intellectual life of Luxembourgers from the 16th to the early 20th centuries. The contemporary art section is also a must-see, and is furnished with works by many of the most important artists of the 20th century. Fans of modern art (and ultra-modern architecture) must visit the superb Mudam Luxembourg-Musée d'Art Moderne Grand-Duc Jean with its collections from world renowned artists. Also worthy of a visit is the Contemporary Art Gallery (Am Tunnel) with its first rate collection of visual arts. 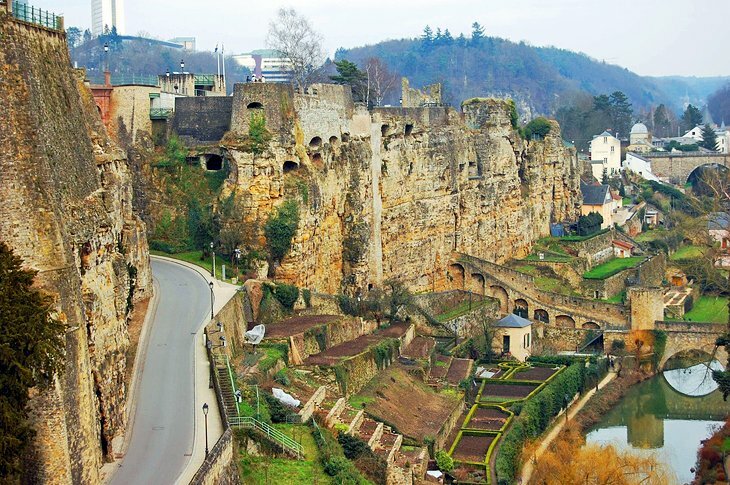 Luxembourg's Bock cliff, with its fortifications and cannon-loopholes, is where you'll find the entrance to the famous Casemates, a 21-kilometer network of underground passages hewn from solid rock. 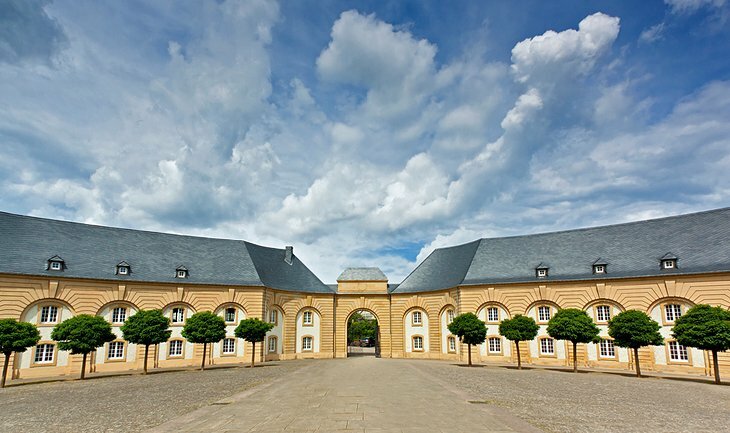 Capable of sheltering thousands of defenders as well as equipment, horses, workshops, kitchens, and slaughterhouses, the Casements cover an impressive 40,000 square meters. Today, much of these remarkable fortifications can be explored on foot. On the Bock plateau itself are the remains of the old castle, discovered in 1963. There are beautiful views of the suburb of Grund and the Rham Plateau, the old 19th-century barracks, and the big towers and remains of the Wenceslas wall dating from 1390. The spectacular Walls of the Corniche in Luxembourg City have been called "the most beautiful balcony in Europe," towering as they do over the old city in the river valley below. It's here, you'll find the big Gate of the Grund dating from 1632. Its ramparts reveal several aristocratic houses and refuges, as well as the ancient convent of the Dominicans and St. Michael's church (AD 987). In the suburb of Grund itself is a large cluster of buildings with the church and ancient Abbey of Neumünster with a 17th-century cloister of Limoges, an organ dating from 1720, and a 14th-century "black virgin." The adjacent buildings are part of the ancient Hospice St.-Jean, founded by Emperor Henri VII, Count of Luxembourg, in 1309. Luxembourg's Place Guillaume, one of the city's largest open spaces, is the former site of a Franciscan convent that has since been converted into a pedestrian zone. In the center is the equestrian statue of William II, King of Holland and Grand Duke of Luxembourg. It's also where you'll find the lovely Town Hall and the famous Trémont's lions. Nearby is the 16th-century House of Raville with its beautiful façade, well-restored balcony, and spiral staircase. Other notable landmarks are the Spanish Turret with its superb views of the Pfaffenthal suburb and the old cavalry-barracks of Vauban, dominated by the Three Acorns, the former forts of Upper and Lower Grünewald, Olizy and Thungen. Another landmark close by is the Grand-Ducal Palace, a gorgeous Renaissance building dating from 1572, which is open for tours throughout the summer months. The beautiful town of Echternach lies on the bank of the River Sûre, which forms the border with Germany. 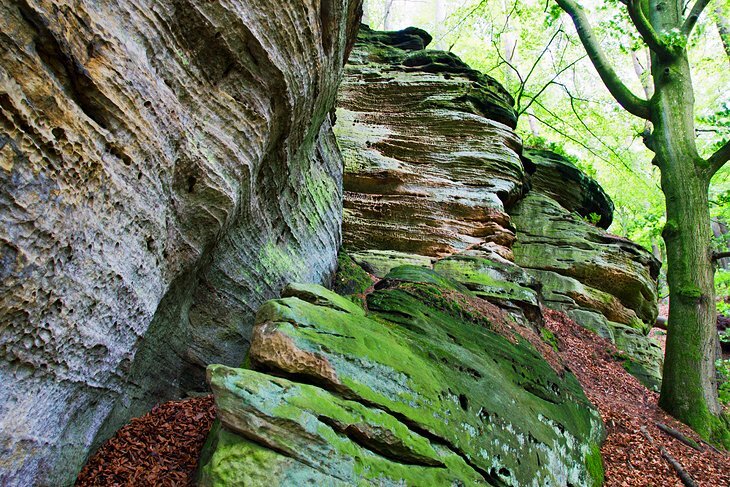 The Mullerthal and Germano-Luxembourg natural park are nearby, and the surrounding woods are crisscrossed with hundreds of footpaths leading to spectacular rock formations, waterfalls, and viewpoints. The town itself is well known for its centuries-old dancing procession, which takes place on Whit Tuesday and attracts visitors from around the world. The old aristocratic houses, narrow streets, and ancient ramparts have helped Echternach maintain its medieval appearance. A must-see is the seventh-century Benedictine Abbey and its superb museum, its four long wings built around a large square courtyard. The Basilica, considered the most important religious building in the country, is home to a crypt with a magnificent white marble sarcophagus containing the remains of St. Willibrord, the founder of the abbey, and its vaults are painted with frescoes dating back to the 10th century. Echternach is also famous for its international music festival, which runs from late May to late June. 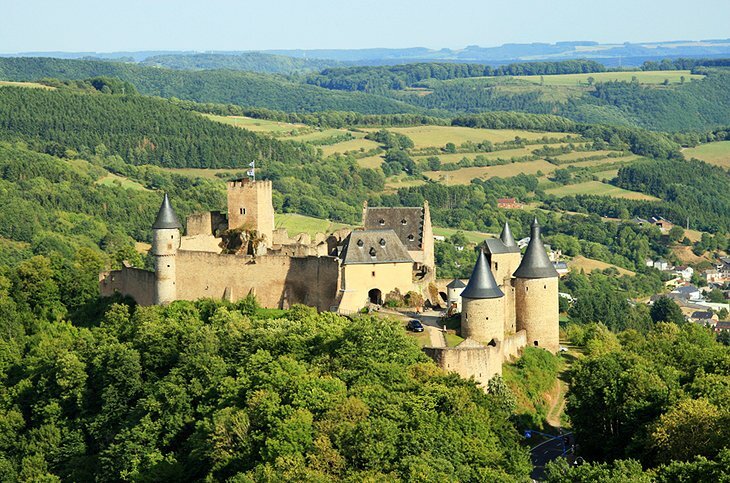 Standing in stark contrast to the rather flat landscape around Luxembourg City, the Ardennes is where you'll find high forested plateaus, sheer cliffs, wooded hills, and hidden valleys, as well as countless impressive views. 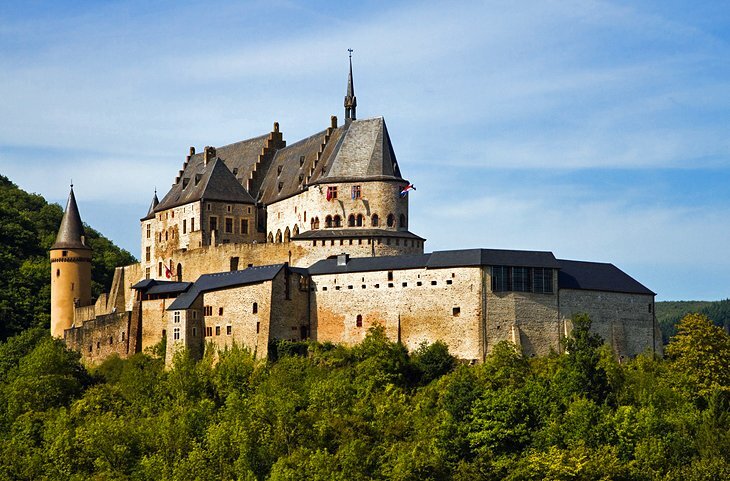 The area - famous as the place where Hitler staged his last great campaign of WWII - boasts numerous castles, fortresses, and fortified farms rising out of the hilltops. 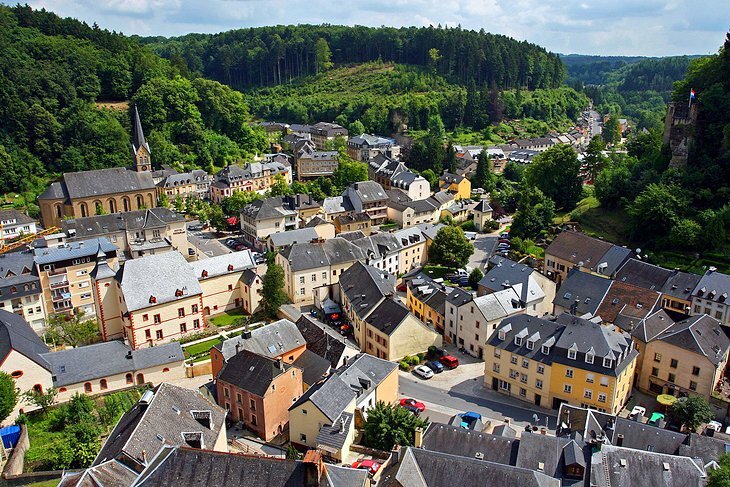 One of the prettiest towns,Wiltz, consists of an upper and lower town and is famous for its open-air theater and music festival. There's also a Battle of the Bulge Museum in Wiltz Castle (another WWII-themed museum of note in the Ardennes is the Patton Museum and monument in Ettelbruck). The quaint village of Clervaux is also worth checking out. While the village lies amid a deep and narrow valley beside the river Clerve, its Benedictine Abbey of St. Maurice and St. Maur, built in 1910 in Romanesque-Burgundian style, dominates the valley. Visitors here can enjoy exhibits relating to the monastic life as well as Gregorian masses. The village of Bourscheid stands high on a plateau and is bordered by the rivers Sûre and Wark. 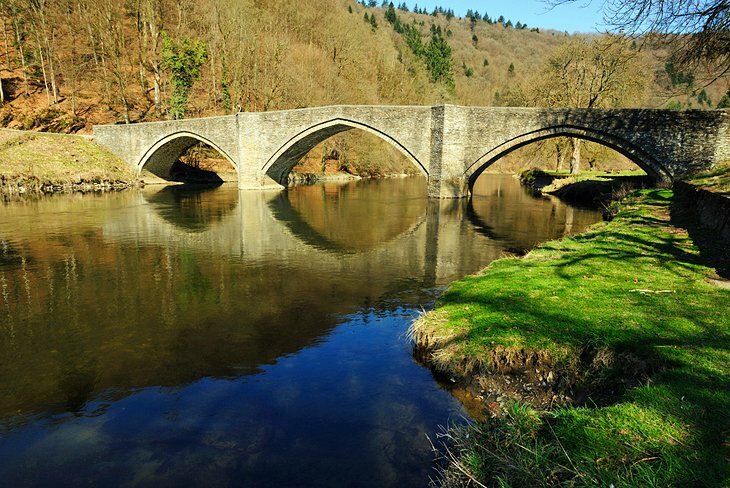 Here, you'll find excellent views and many pleasant walks to other quaint villages, including Michelau in the Sûre Valley, Welscheid in the Wark Valley, and Kehmen on the plateau. For bathers, there are two river beaches at Bourscheid-Plage and Dirbach. 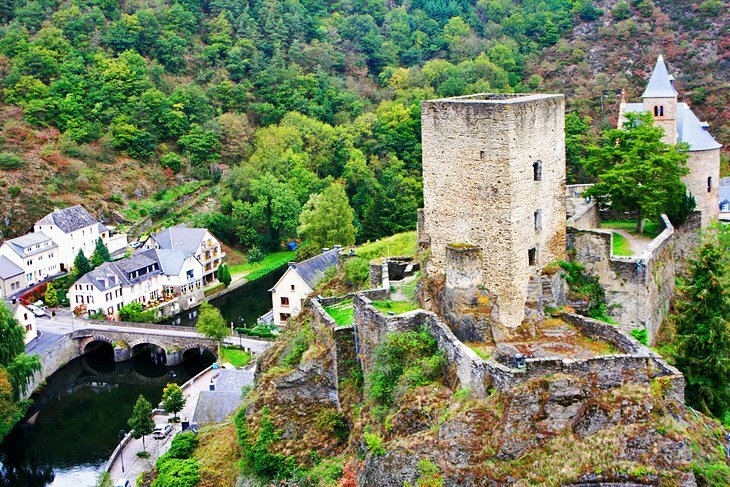 This region of the Ardennes is very much dominated by the ruins of the fairy-tale Bourscheid Castle, which looks down from a rocky peak 137 meters above the Sûre. Dating from the 10th century, the castle has been largely restored and is accessible to visitors (self-guided audio tours are available, with guided tours available upon request). If you can manage it, try to view the castle at night when it's lit up - a truly memorable experience, particularly from the village. The Moselle region of Luxembourg occupies much of the eastern part of the country and features slopes flanking the majestic Moselle River. The many picturesque villages tucked along the banks of the Moselle recall an ancient charm and are fun to explore. They are renowned for their varied cuisine produced from locally-grown products. It was also an area much favored by the Romans, and as a result many archaeological remains can be found dispersed throughout the region. One must-visit town is Mondorf-les-Bains, a small town famous around the world for its thermal springs. One of the newest attractions here is Mondorf le Domaine Thermal, a large spa complex that houses a health center, sports and leisure club, and hotel. 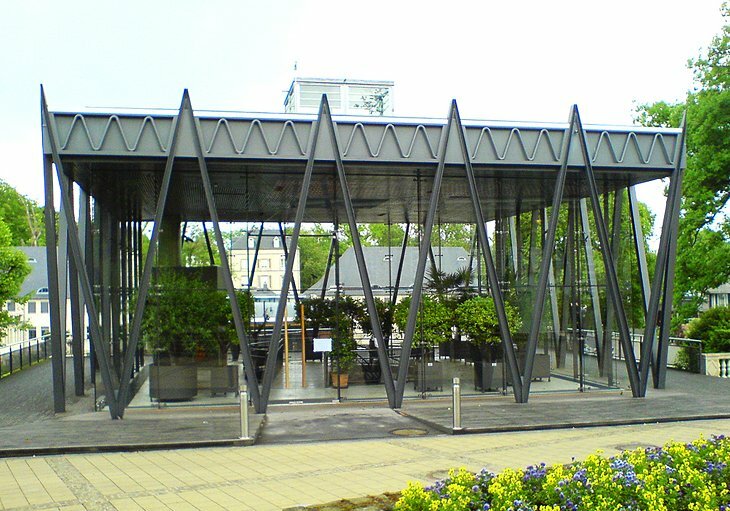 The complex's thermal installations are fed by springs supplying a mineral water of 24°C that is famous for its medicinal qualities. Afterwards, stroll through Mondorf Park with its large collection of trees, shrubs, and flowerbeds. Other highlights include 18th-century St. Michael's Church with its furniture and frescoes; the Castel, a little Roman fortress transformed into a hermitage during the Middle Ages; and the Art Nouveau houses. Upper Sûre Natural Park consists of plateaus, narrow valleys with wooded slopes, and the lake of the Upper Sûre dam. The park is great for leisure activities and watersports, as well as for its wildlife and ecotourism. Numerous walking tours - whether guided or self-guided - include everything from pleasant circular tours to more arduous treks around the lake. A fun sculpture trail has also been added, as have excellent solar-powered boat tours across the large reservoir. Other activities include fishing, swimming, sailing, and diving. The area also possesses a rich cultural heritage, and the Nature Park Centre in a disused cloth mill includes a museum with interesting artifacts and exhibits relating to both the park and the local area. A number of events also take place here, the largest being the biennial Water-Art Festival, an event that attracts more than 200 musicians under a theme of "Rock meets Classic." A must-visit nearby is Esch-sur-Sûre, a spectacular small village set in the mountains and skirted by the river Sûre and widely regarded as one of the most outstanding sites in the country. The village is dominated by its ruined manor house, built in AD 927 (open year round, free admission) and by the cliffs looking down to the river. 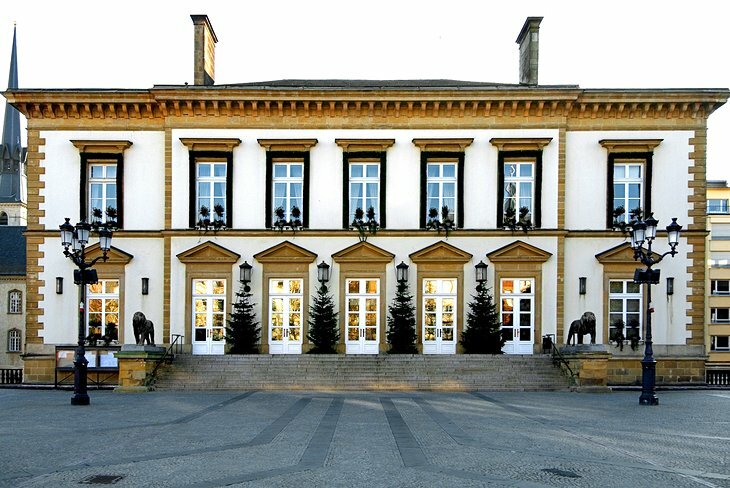 Walferdange Castle, the Grand Ducal residence until the end of the 19th century, lies at the entrance to the Grunewald Wood on one of Luxembourg's principal tourist routes and is just a short distance from Luxembourg City (it's now a part of the University of Luxembourg). The village of Walferdange boasts picturesque scenery due to its location at the junction of the Alzette Valley with its lovely wooded heights. In addition to its great views, the village is well known for its roses as well as a large archeological site that includes a Roman villa and an underground aqueduct. Larochette is a quaint old market town that lies in a narrow, rocky valley surrounded by woods. The town is dominated by two old and partially rebuilt castles that stand on a crag high above the valley of the White Ernz. Larochette boasts a superb medieval square, a museum of industry (free admission; open year round), and a number of historical monuments dotted along its many old streets. Be sure to pop into the Neo-Roman church for its Art Nouveau frescoes. The village is a hiker's haven, with walks for all abilities heading through the woods and countryside and leading to notable viewpoints such as the castles of Meysembourg and Nommerlayen, with the remains of a Roman camp at Aalburg. Berdorf is one of the main tourist areas in the Grand Duchy of Luxembourg and lies on a vast tableland overlooking the valleys of the Black Ernz, the Sûre, and the Aesbach rivers. Numerous well-kept footpaths crisscross the valleys and chasms, where you'll find tall rocky hills with fine views and more than 3,000 acres of forest. It's also a tremendously popular area for rock climbers. Beaufort lies on a plateau in the Mullerthal region, and is well known for its near perfectly dimensioned 12th-century castle, as well as a Neo-Gothic church. Although much of the castle is uninhabitable, it is still wonderful to explore. A number of footpaths lead through the wooded hills to great views of the surrounding countryside, through spectacular rock formations, and the gorges of the Hallerbach and the Saueracht, towards Grundhof and Dillingen in the Sûre valley. Vianden is an extremely picturesque town straddling both banks of the River Our. Its fine feudal manor dates back to the ninth century and is unrivaled in the Ardennes and Eifel for its architectural significance. Also of note is the medieval outer wallencircling the town with many impressive guard towers. The parish church with its two naves was built in Gothic style in 1248 and has been completely restored. The former Trinitarian cloister, dating from 1250, houses a lapidary museum, and a small art museum in a former mansion has a number of notable works from 18th- and 19th-century painters. The house where author Victor Hugo lived during his exile in 1871 now houses a collection of souvenirs of his various visits to Vianden. A large network of walking paths, well maintained and signposted, offers access to the beautiful countryside of the Our Valley, and a chairlift climbs to a height of 440 meters where visitors can enjoy splendid views. In the town of Bettembourg, just six miles from the capital city and three miles from the French border, Parc Merveilleux attracts thousands of visitors each year. This amusement center, with its fairy-tales, game enclosure, playground, mini-train, pony express, mini-golf, restaurants, and concerts offers fun and relaxation for all ages (but especially the kids). NEW YORK IS WAITING FOR YOU, LETS TAKE YOU THERE!